1. European integration and the Treaty on European Union; 2. The EU institutions; 3. Union law-making; 4. The EU judicial order; 5. The authority of EU law; 6. Fundamental rights; 7. Rights and remedies in national courts; 8. The infringement proceedings; 9. Governance; 10. Judicial review; 11. Citizenship of the Union; 12. EU law and non-EU nationals; 13. Equal opportunities law and policy; 14. 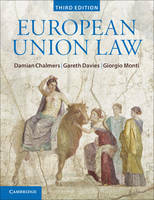 EU criminal law; 15. The internal market; 16. Economic and monetary union; 17. The free movement of goods; 18. The free movement of services; 19. The pursuit of an occupation in another member state; 20. Trade restrictions and public goods; 21. EU competition law: function and enforcement; 22. Antitrust and monopolies; 23. State aid law.